It's got drums. It's got FX. But is it super? If you´ve read our guide to the best free music-making software on the net, you´ll know that there´s some great stuff out there. Now developer Denis Eismann is hoping to add his name to the roll-call of gratis goodness with the release of the SuperDrumFX acoustic drum module. This is a basic drum sampler that comes with a 13MB drum set. While this is tiny in comparison to the multi-gigabyte drum libraries that are available, the developer claims that a few clever sound shaping techniques have enabled him to produce a kit that sounds realistic. 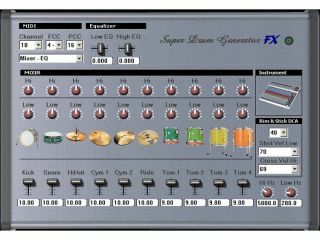 SuperDrumFX features a mixer with EQ, and also an effects unit that contains two reverbs, a delay and a flanger. It´s said to be designed with electronic drum kit owners in particular in mind, with note mapping being pre-configured to work with Roland´s V-Drums. A Windows VST plug-in, SuperDrumFX is available for download now. You can get hold of it at the SuperDrumFX website.